We accept cash, checks, MasterCard, Visa, and Discover cards. We also accept debit cards. Payment is due at the time of the visit. For out of network claims we will supply you with an invoice for you to submit to your insurance company for direct reimbursement. Treatments are by appointment only. Emergency appointments are available if there is time in the schedule. Please call. Please be on time for appointments. 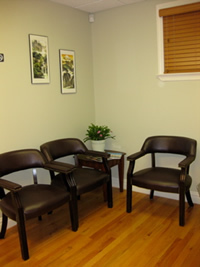 Unfortunately, because schedules are often tight, your treatment time may be shortened if you arrive late. Twenty-four hour advance notice is requested for cancellations. Patients will be responsible for the appointment fee for any missed appointment or non-emergency late cancellation.